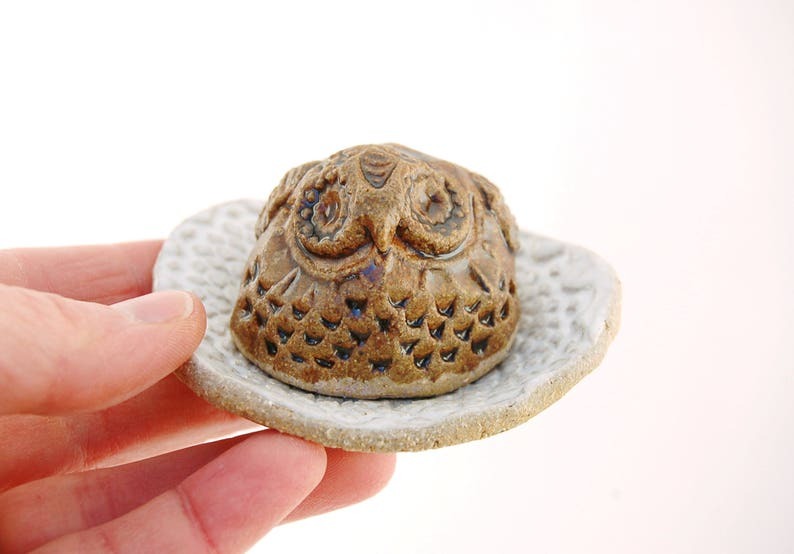 Ceramic Owl Nesting Sculpture - Whimsical Owl Decor Set - Brown Owl White Nest Duo - Fine Art Owl Figurine - Owl Totem Statuette "Bette"
Bette is a robust, nesting ceramic owl sculpture, comprised of two separate pieces. Bette herself was formed using the pinch method from a small ball of stoneware clay. She was impressed with a variety of textural implements including vintage buttons, hardwood stamps, a small seashell and a standard issue clay knife. She was glazed in a matte translucent brown glaze that pooled to a high gloss within her surface texture. Bette's nest was formed from a doily impressed slab of clay and glazed with a white celadon. Both pieces were fired to cone 6 oxidization in an electric kiln. The nesting Bette would make a nice gift for your favorite owl lover. Hide a chocolate "kiss" under her body cavity and gift her to your valentine. I guarantee it's a perfect fit! Ceramic Owl Sculpture - Fine Art Owl Totem - Home Office Decor - Rustic Raptor Figurine - Textured Clay Slab Stylized Owl Statue "Shirley"
Mixed Media Ceramic Owls Sculpture - Whimsical Blue Birds Acorn Caps - Woodland Decor Art Sculpture - Miniature Owl Totem - "Balancing Act"
Decorative Owl Sculpture - Fine Art Owl Totem - Coil Built Raptor Figurine - Hand Built Clay Whimsical Bird - Ceramic Owl Statue - "Elfrida"
Ceramic Owl Sculpture - Stoneware Clay Figurine - Free Standing Owl Decor - Fine Art Bird Statue - Owl Totem - Navy Blue Denim Owl "Marta"